Alnus glutinosa, medium sized native tree suitable for damp or wet sites. The cones attract siskins, goldfinches and redpolls in winter. 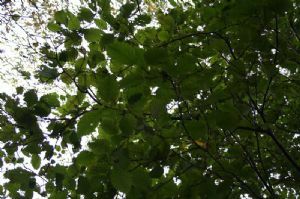 Alders produce long, hanging catkins in early spring, good for insects. The Alder tree resists wet rot and was grown for making clogs in Wales. The piles on which Venice and Amsterdam stand are made from Alder. For centuries, herbalists used the bark and leaves in brews for use as an astringent in reducing fevers and inflammations, and as a quinine substitute. Alders have nitrogen-fixing bacteria on their roots which enrich the soil. The leaves and branches are said to have pesticidal qualities. The Alder is another native tree which can be trimmed into a hedge. It is fast growing, especially in moist or wet soils, is very wind resistant and produces nitrogen nodules at its roots. This tree is a very good source of dyes - yellow, green, pink and red being produced from the bark, young shoots and catkins. An ink can also be made from the bark. Small trees available bare-rooted, approx 2foot 6inches tall.